Otherland. In many ways it is humankind’s most stunning achievement: a private, multidimensional universe built over two generations by the greatest minds of the 21st century. But this most exclusive of places is also one of the world’s best kept secrets, created and controlled by an organization made up of the world’s most powerful and ruthless individuals, a private cartel known – to those who know of their existence at all – as The Grail Brotherhood. Though their purpose in creating Otherland is still a mystery, it may not remain so for long. For they have exacted a terrible price from humanity in the process, and even their highly organized global conspiracy cannot hide the nature of their crimes forever. And now a small band of adventurers has penetrated the veil of secrecy that prevents the uninitiated from entering Otherland. But having broken into the amazing worlds within worlds that make up this universe, they are trapped, unable to escape back to their own flesh-and-blood bodies in the real world. And as dangers and circumstances split their party into small, widely scattered groups, their only hope of reuniting lies in returning again and again to the River that flows – in one form or another – through all the worlds. But the odds seem to be completely against them as they – and the one outsider with whom they might join forces – become hopelessly lost in realms where an Ice Age tribe’s fears can only be quenched in blood – where insects are as large and deadly as dinosaurs – where they are caught in the war between a man made of straw and one made of tin – where cartoon ads take on a life of their own – where humans strive to survive in the aftermath of an alien invasion – and where one among their party is actually The Grail Brotherhood’s most terrifying weapon – a sociopathic killer who has never failed and whose current mission is to make certain that not even one member of this little invasion force lives long enough to reveal the truth about Otherland to the people of Earth. 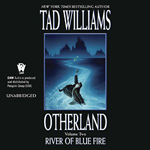 The sequel to City of Golden Shadow and the 2nd book (of 4) in the Otherland series, River of Blue Fire is a solid “middle book” in the series. Picking up where City of Golden Shadow left off, this book moved the pieces of all the players in the story without seeming to progress the plot too much. This is a common feature of “middle books” so was expected, though made the reading (listening) slow sometimes. At the point that City of Golden Shadow left off, the “hero” group was somewhat divided, with Renie and Xabbu in one simulation, Orlando and Fredericks in another, and the rest of the “hero” group in yet another sim. Paul Jonas’ sim, too, went through a few worlds, separated from the rest of the crew. Much of this book was spent with them still spilt, each learning more about the rules of the simulation world through their experiences in the world. Martine’s character, and her disability, were explored in detail in this book, bringing her to the forefront of the third hero group as a main character (to go along with Renie and Orlando). The bad guys also moved, and some of their motives were identified…and the mysterious Sellers, while staying in one (hidden) location, seemed to be doing more to try to help bring down the Otherland. All in all, there isn’t much to say about this book that I didn’t say about City of Golden Shadow. I enjoyed this book, though didn’t think it was as strong as the first book in the series. In this book, author Tad Williams had some fun with the simulation worlds, making alternate worlds of popular stories such as The War of the Worlds and The Wonderful Wizard of Oz. It was fun to go through the book and try to see what book was referenced (if any) for each sim world. The book was fun and the cyberpunk ideas were interesting, but there was nothing new introduced in this book. The rules were better defined through the course of the plot, but there wasn’t a lot of actual progression towards the heroes saving the day (or not). The audiobook was great to listen to, if the narration was slightly slow. I listened to it slightly sped up (using the 1.5x feature for spoken word playback on my iPhone) and it seemed perfect. The only downside to listening to these books in audio is that now I want the 3rd book in the series, Mountain of Black Glass to come out in audio…I’m not sure when or if it will be done, but I hope that it does come soon so that I can continue listening instead of having to switch to some printed media. Audiobooks are a great way to experience this series (so far).